Eyes on Africa is becoming Eyes on Adventure and adding exciting new destinations - new and expanded website coming soon! India, Madagascar, Ecuador, Peru, Brazil, Costa Rica, Galápagos, Pantanal and Amazon. The Lodge lies in a 4000ha private wildlife concession between Tarangire National Park and Lake Manyara. 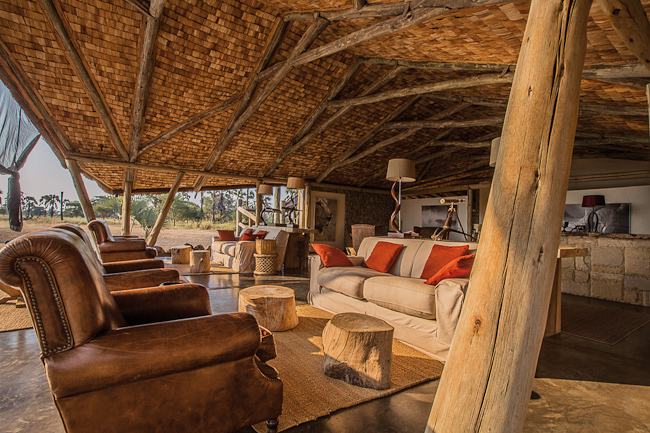 Eight stylish and secluded tent-style suites evoke the spirit of a vintage contemporary safari. The principle house of the Lodge offers a full service gourmet restaurant to whet your appetite, a lounge bar complete with outdoor fire place to quench your thirst and toast your toes and a fully stocked library to broaden your horizons. You may even choose to enjoy your read on the viewing deckwhich boasts awe-inspring views over Lake Manyara. Outside, a pool is hidden in the trees for dips in the afternoon heat and the Chem Chem Amani Spa offers a new meaning to utter relaxation.. The permanent structure of Lodge principal house reflects the form of a landing flamingo with its two open big wings. One wing holding the dining area and the outside fire place the other wing containing the bar, lounge, fire lounge and library. It is a very light and open structure to be as close to nature as possible. The eight tented suites are situated at least 80 metres apart to ensure total privacy, with each tent having a spectacular lake view. Each tented suite is situated in a private palm-island enjoying a wonderful, private lake view. The suite, 100m2, is a combination of canvas, lava-stones and wood. Where else if not in the African Wilderness you want to sleep under a canvas roof? Tents are a minimum of 80 metres apart to ensure total privacy. It is built out of one suite as above plus a 50m2 vintage tented room with its own bathroom (indoor shower) and dressing. The two rooms are built on the same platform and are connected through a small (1.5m) wooden bridge. The tented room contains 2 single beds, rocking chair and small desk, viewing terrace and has as well its one private entry. It can sleep up to four children or two adults. Nestled in its own private palm-oasis you find the spa cottage as well our outdoor swimming pool. Chem Chem Safari Lodge offers a variety or wildlife excursions, ranging from tracking animals on foot on its private wildlife concession, a moonlit game drive, to a private guided safari through Tarangire, Manyara or Ngorongoro National Parks. Safari options are available for driven tours, guided walks and even hot air balloon rides. If you would prefer to keep your feet firmly on the ground while still getting a flavour for the local way of life, your needs will be expertly catered for. At Chem Chem Safari Lodge you do not need to venture far from home to sample the African culture, or encounter an animal sighting. There are bush-cooking experiences available on site, guided walks and opportunities for track reading through the lodge’s private grounds, so guests can learn how to read footprints and animal waste. To truly get a feel for the local pace of life, guests may even take a leisurely jog with a massai warrior along the shore of Lake Manyara. Others who crave a more restful experience will be spoilt for choice by the veritable programme of revitalising and relaxing treatments available at Chem Chem Amani Spa. And while all treatments are performed using the sumptuous, organic ILA product range, they can be given both in the lodge and in the open air, against the backdrop of the glowing African sunset. A walk through the wildlife-concession’s Palm-Forest approaching giraffes. A chaperoned stroll around Lake Manyara observing the thousands of flamingos. A delicious private meal for two under the African sky. – Fabia and Nicolas and their team will personally take care of all these experiences as well as many others you won’t even expect. From December to March the temperature lays between 20-35°C and occasional thunderstorms can happen, it is called the “green season”. It is an excellent time to watch birds but as well to see the calving of the wilder beast and Zebras. In April and May the big rains are expected and the lodge is closed from 1 April to 14 May. From June to October the temperature lays between 15-25°c. It is the so called “dry season”. An excellent time to watch animals gathering on waterholes and rivers on the search of water. In November a small rain normally kicks in turning the dusty savannah into a lush green one. The concept of Slow Safari was born at Chem Chem Safari Lodge. Key is the ethos of a safari as a tangible, sensual experience beyond the confines of a vehicle, where on foot guests can see, feel, touch and smell the African bush for themselves. It’s easy to get caught up in the 4×4 rush hour in a fevered quest to spot the ‘Big Five’, however true safari aficionados understand it’s what you discover for, and sometimes about yourself outside the vehicle, that counts. Slow Safari takes away the hectic qualities of safari but doesn’t remove the adventure and excitement: from gazing at an unfamiliar night sky to the magic of finding ancient cave paintings, these moments add a magical quality to your trip just as much as spotting a rhino or a herd of elephants – it’s all about slowing down and getting a new perspective on things. “Slowing down to appreciate, stopping to explore, staying longer to discover and ultimately realizing that by relaxing one can find the heart and soul of a countrywhilst replenishing mind and body”. Some of the experiences that are part of the Slow Safari ethos include walking safaris with a private guide in Chem Chem’s 4,000 hectare private, whilst activities such as, private sessions in track reading, picnics, visiting Maasai villages, and dining under the stars will be all about interaction and filling personal aspirations. Of course as part of the Slow Safari, guests are welcome to sit and stare for hours on end too with a glass of Pinot in hand, savouring Tanzania in wide-eyed amazement as it stretches out before them. All content © 2002-2016, Eyes on Africa, Ltd. All rights reserved. All images © 1995-2016, James Weis/Eyes on Africa (unless otherwise noted). All rights reserved.